To a lot of folks, this time in November means a holiday feast with all the trimmings – turkey, stuffing, mashed potatoes, pies and other rich foods. But for people living with gastroesophageal reflux disease (GERD), it might mean something different. Today marks the beginning of the 17th Annual GERD Awareness Week (November 23-29). 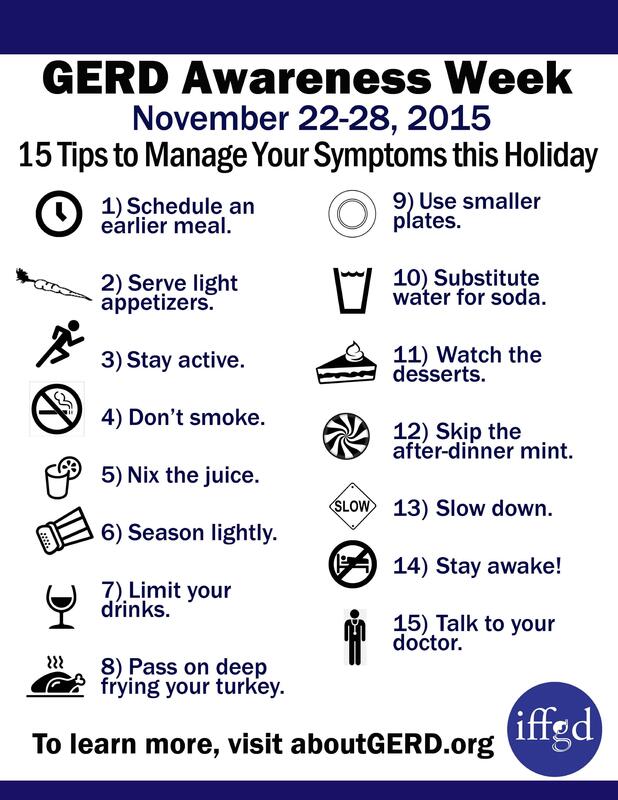 GERD is a common disease spotlighted each year during the week of Thanksgiving. The International Foundation for Functional Gastrointestinal Disorders (IFFGD) first designated GERD Awareness Week in 1999 to raise awareness for increased research and understanding of the condition. Chronic heartburn is the most common symptom of GERD, but there are several less common symptoms associated with GERD that might arise during the Thanksgiving holiday. Digestive Health Alliance (DHA) has outlined several ways you can get involved and spread awareness during GERD Awareness Week, and the DHA – as well as IFFGD – have several available resources if you’re looking for more information about the condition. During GERD Awareness Week and all year long, you can connect with more than 4,000 others in the PatientsLikeMe GERD community. Read others’ personal stories about GERD in the Digestive and Intestinal forum and connect with others by sharing your own story.